There’s no doubt about it: The canon of superstar guitar heroes has recently inducted a new member, and that man is Jack White, the man who leads a trifecta of successful rock bands and has also emerged as a talented producer. By now, of course, you’ve heard that he appears alongside Jimmy Page and The Edge in the star-studded meeting of the minds It Might Get Loud. 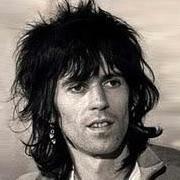 And now, it looks like he is collaborating with an even bigger rock legend: Keith Richards. In the mean time, Richards is busy putting together a deluxe edition of Exile on Main Street (score! ), co-writing an autobiography and denying rumors that drummer Charlie Watts has quit the Stones. But, either way, it looks like the band will be back in the studio next year, if Keef has anything to say about it. "One way or another," he tells the magazine, "I'll get them back in line." Neither made an impact outside of their primary band. I'd say Keith is the bigger star, Jimmy the bigger guitarist. This X-Pensive Winos fan disagrees vehemently. Keith's other band played far better than the Stones during that time period. As much as I'm a giant fan of Jimmy, Keith is more of a self-reliant musician. Yes, fine but insofar as stardom, what impact did the X-Pensive Winos make? None. and The Firm are more legendary than the Winos. Uh....I wouldn't go that far. But we're all entitled to our opinions. I like The Firm and would characterize them as memorable, but few would call them legendary. Let's just not revisit The New Barbarians!! Sorry '59, but even Keith has his forgettable moments! Yeah, the New Barbarians were interesting...but hardly the Winos. I guess Jack White is Keith's new friend of the moment. It's just that the moment is getting too long. The Exile On Main Street-Deluxe Edition sounds like good news though. I'll buy that reissue, but I haven't been convinced that the other Stones reissues, that have come out this summer, are really remastered in the true sense of the word. Has anyone seen any credits on who did the remastering for those alleged remasters? Bob Ludwig at Gateway Mastering Studios did the remastering for the Stones Virgin reissues. The difference is I'd say that Jaggar really dominated the public image of the Stones(although Keef had more to do with there best music IMHO) where as Page and Plant shared a more equal footing in Zep. Jack is a busy mofo.